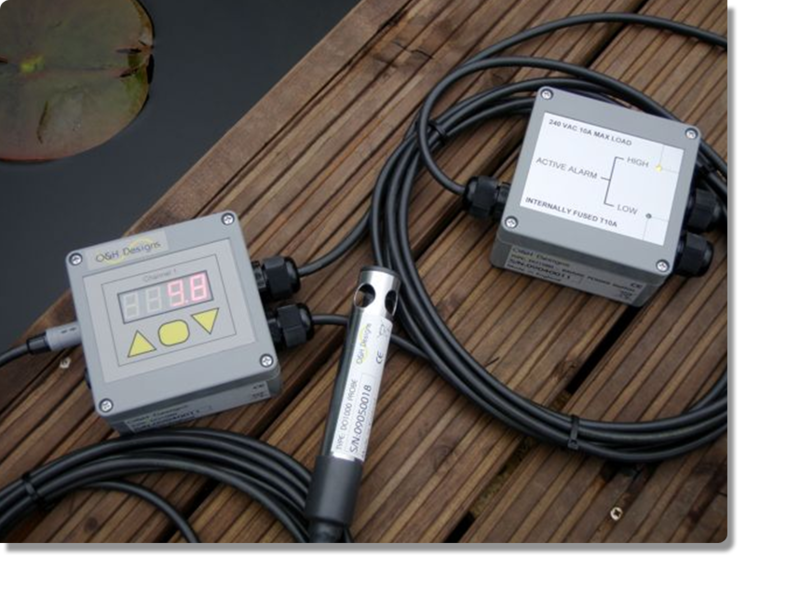 The DO1020 measures dissolved oxygen levels in tanks, ponds and lakes and turns on the installed aeration system when it's actually required, thus saving energy. The system can also be used to control DO2 in both static and transportation tanks. This cost effective system can ensure DO2 levels are maintained and fish are kept at their best and in an unstressed state. The DO1020 and power switch can be attached to an aerator or on the side of the lake or control room. The system is configured via the simple keypad/display. Once the lower DO2 threshold is set, the power switch will turn on the aerator system long enough to bring the DO2 levels back to safe levels. A high level threshold can be used to circulate the water during high DO2. Readings can be logged to a PC via the RS485 communication port. *1 Can be wall / pole mounted in static applications - optional extra (factory fitted). *2 Single phase control as standard - 3 phase as an optional extra.